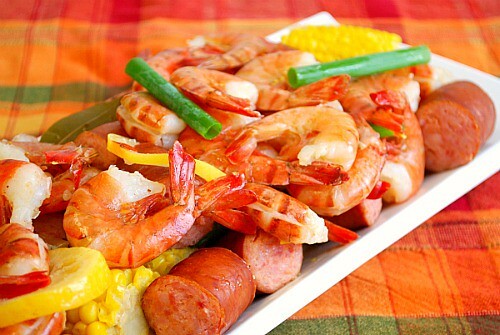 Low Country Boils are a very casual dining event where a large pot of seasoned water cooks an entire meal of potatoes, corn on the cob, sausage and of course, lots of shrimp or even other seafood like crawfish. This has to be the ultimate one pot meal for my husband because he loves (like really loves) shrimp! There are many variations to flavor up the broth that cooks up the meal for a low country shrimp boil. For ours, it was a super easy combination of water, sliced lemon, a few bay leaves and classic Old Bay seasoning. You can find old bay seasoning near the fish counter of your local grocery store or in the spice aisle. Some other ingredients I've seen used in the broth includes beer, other spice mixes, and aromatics. Have fun with this recipe any time of year. This makes for a great party and a tasty one at that! Place steamer basket in IP. Add 1 tablespoon Old Bay seasoning, bay leaves, red potatoes, corn and 2 cups water. Add sausage, shrimp, 1 cup of water and remaining Old Bay seasoning. Transfer to a serving platter, newspaper lined table, or large bowl. Garnish with green onions (optional). Enjoy with warm bread. drizzle with melted butter and dig in!